I was rather pleased to be asked recently to take a look at a ukulele model from Ohana, their SK-25 model soprano. Here is my review. The SK-25 model is soprano sized, Chinese made, and represents what I think can be best described as Ohanas entry level 'serious' instrument. That is to say, there are numerous ukes in the Ohana range that can be bought for less money than this one, but they are a mix of laminate ukes or part laminates (nothing wrong with those, just they are what they are!). Equally, there are many Ohana instruments priced higher than this one, but the SK-25 is the first in their line of all solid wood ukuleles. It has an RRP of $219. A search around on the internet shows that most dealers are offering these at cracking prices. In the UK Southern Ukulele Store list these for £119 which is a heck of a price for an all solid ukulele. At that price it represents a good comparison uke to the Brüko Model 6 uke that I have reviewed on Got A Ukulele and rated highly and aside from that appears to me to be one of the best value all solid instruments around. The SK-25 is a standard shaped soprano uke (following the classic Martin O shape), with an all solid mahogany body and a rosewood fingerboard. It's very traditional looking and a rather nice colour thanks to that mahogany wood. As an entry model in the solid wood range it's also lacking much bling with no binding or fancy finishes (those who read this site regularly will know that is just fine with me - don't do a lot of bling!). The body is finished in satin, not gloss, but feels very smooth and tactile. There are no build flaws I can see or sharp edges where the top meets the sides. All looks good, solid and well made. The top and back are made of single pieces of mahogany though the grain could have been squared a little straighter with the build (it runs on a slight angle on the back), still it is nice straight grain. The sides have a curlier looking grain which looks very nice also. The back itself is slightly arched which is a really nice thing to see on an instrument of this price and will serve to aid volume and projection. A nice touch. Around the soundhole is an inlaid decorative ring. It's not quite finished perfectly at the top, but it's not a big deal and much nicer to see an inlay than a transfer which tend to wear off over time. Having a peek inside shows a very tidy instrument. Standard bracing style and un-notched kerfling holding the top and back to the sides. Very few glue spots at all and a nice woody smell. The bridge is a slot type meaning easy string changes (just tie a knot in one end and slot in the bridge!). I have heard some people suggest these are not traditional, but actually I think that is wrong. Vintage Martins employed these bridges, and the tie bar design is something that was brought to ukulele from guitar. Personally speaking, I like the look of a tie bar bridge, but this one is just fine and finished well (it is made of rosewood) and also adds to the Martin styling. The saddle is equally well cut and is made of bone - another nice detail at this price as bone is considered to add to the sustain of the instrument. Its uncompensated, but I don't see that as much of an issue - I am seeing more and more compensated bridge saddles appearing and so far the jury is out with me. The ukes I own without compensated saddles tune just fine for me! So overall, body wise I am impressed. It's a plain ukulele body (as is the Bruko), but it is all well made and looks good if a little plain. The addition of that arched back, inlaid soundhole rosette are nice plus points at this price even if the rest of the design is sober. Moving on to the neck, its a hard wood neck made of three pieces with a joint at the headstock and at the heel - very common at this price point. That makes no difference to the sound of the thing, but it's something that some buyers like to know.. The neck is topped with a rosewood fingerboard which is nicely uniform in colour and is set with 15 nickel frets. The edges of the fingerboard are unbound meaning you can see the ends of the frets, but they are nicely finished and really smooth with no sharp edges to snag the fretting hand. Tuning is provided by Grover brand open geared tuners. Now, I much prefer friction tuners on a soprano ukulele (based on looks alone) so that was something of a disappointment, (that's just me...), but as tuners go, these are SUPERB quality models. I have played several ukuleles many times this price that are let down by shonky tuners, so seeing these was a real treat on an instrument of this price. They are finished with cream buttons and are essentially the same as those on my Martin T1K. You may note in the picture that one seems set a little wonky which is a shame, though not a showstopper. I suppose for Ohana the choice to go geared was probably because, as a beginner instrument, geared tuners are less fuss for the new player, and I can understand that. I still prefer frictions on a soprano though! As a package - a very nice traditional looking ukulele. One or two cosmetic niggles for me, but nothing that will affect how it plays (and I am yet to find THE perfect ukulele on cosmetic grounds, though I will continue to search!). Well, how DOES it play? Well I will say at the outset that I had never (surprisingly) played an Ohana in anger before. Had a couple of strums on other peoples, but not much more than that. I wasn't really sure what to expect to be honest, and thought perhaps it would sound rather bland considering the price point. I was wrong. The first thing that hit me was the volume which is really surprising and noticeably greater than the Bruko 6. Helped by that arched back, the uke really does project and with the right strum can bark when needed! Action and set up were just how I like them, and intonation was pretty much spot on everywhere so no complaints there. A well put together uke. There is a richness and a warmth to the sound that surprised me for an entry level soprano. Often ukes priced at this level can sound either quiet but interesting, or loud yet tinny or boxy, but not both. This has a much richer sound than the Bruko which sounds thin in comparison. Sure, it doesn't have the richness sustain and harmonics of a Kamaka or a Koaloha, but that is hardly surprising considering it is a fraction of the price. But it certainly will be capable of holding it's own in a jam session or a solo performance. Cheap sounding it is not. The SK-25 comes strung with Aquilas, and not being my uke I haven't changed them. I'd wager a string change to fluorocarbons would perhaps improve the tone even more. Surprisingly good sound for the money. 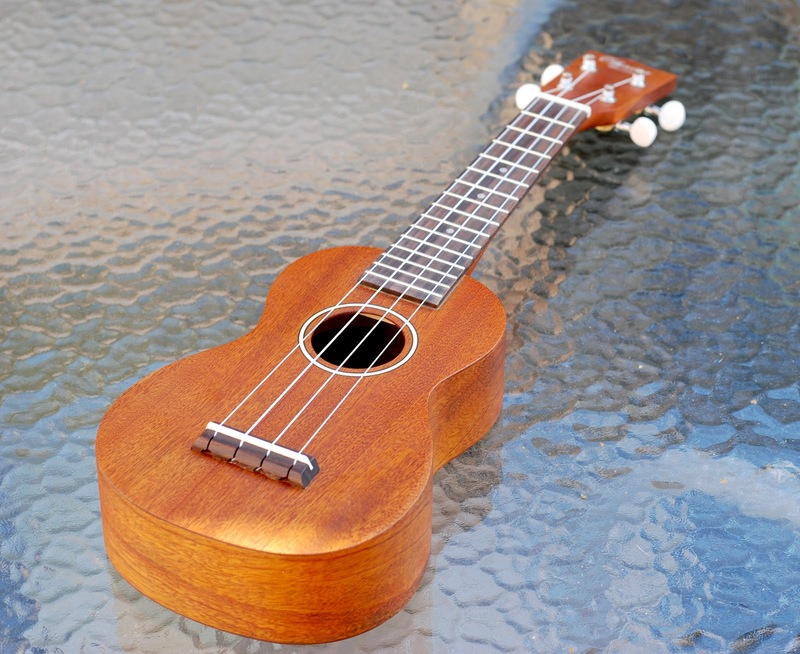 And back to that Bruko - when I wrote that review I sent a bit of a dig towards other makers as I was so impressed with getting a solid wood uke for a little over £100. This Ohana fits into that category, and it is my fault for not realising that. I prefer the idiosyncratic looks of the Bruko over this, but as an instrument the Ohana is quite a bit more in many areas, particularly the tone which is much rounder. I'd say this is a sound workhorse ukulele which would be as at home going in to the hands of a new player as it would fitting in the collection of a more seasoned player. Will be sad to see it go! Available from Omega Music if you are interested in grabbing one. AND! As a final teaser - I have been pointing out that November 2012 marks the third anniversary of Got A Ukulele. I am delighted to announce that the kind folks at Ohana have offered a SK-25 as a competition prize to help mark my celebrations. Keep your eyes on the site in November for more details! Enjoyed this review and might have gone this route when I recently gifted my granddaughter with a new Makala Dolphin (per your review of that instrument), but your Ohana review was not available in time for that purchase. However, she and I both love the Dolphin as an entry level uke. Meanwhile, I am a fairly recent owner of the Ohana CK-35L super concert and am very keen on it, with the same reservation you mention for the SK-25: No side fret markers, a real disappointment for me on any ukulele. Otherwise, I applaud Ohana for the high quality (in looks and sound) of my CK-35L, which needed no further setup upon arrival, and since I have found all your other reviews and recommendations to be on target, feel sure that the SK-25 is a great buy. It certainly looks very nice in the photos you provide. On an unrelated point, have you considered publishing a book or e-book of chords and tips for those who prefer what I call the alternate Wendell Hall tuning of EAC#F#? It works especially well for me on all ukes of concert size or above, but I have never seen anything published in the way of "aids" for chord names and the like for ukes tuned this way although I have seen occasional mentions of other players who use this tuning for special purposes. It's my preferred tuning most of the time. Thanx. Thank you for this informative review. I prefer geared tuners on all kinds of ukuleles. Many do uke4u - is your reason due to issues with friction tuners? There are some cracking friction tuners on the market that are smooth as butter! Would SO LOVE to have one, but can't seem to find one at the moment. Any suggestions? Online is fine if you buy from a real music store you can call and ask them to check over. Ohanas tend to be good though. Thanks for the promenademusic link! Wish i could visit their shop any try out the Ohana sk25, as i'm v.keen on it, but i'm quite far away (north Somerset!). Have you bought from them before? And, when I ring them, what kind of questions should i ask? Thank you very very much for being soooo helpful, and especially for the thorough review. I'll give them a call tomorrow. Again, ta! I think geared tuners stay longer in tune than friction tuners. Uke4u - with respect, I think that is a common misconception, sure cheap frictions are terrible, but I have some pro frictions on some ukes and can put those instruments down for weeks and they still hold tune. What the action like on this? Steve - action isn't dependent on the model as its adjustable. It's possible to have an incorrectly set action even on the most expensive ukes. Admittedly on cheaper ukes they can leave the factory less than ideal. Hi Lisse, the Jumping Flea Market in Rotterdam is well worth a visit if it is close enough to you. They have lots of Ohana (and other) ukuleles. www.jumpingfleamarket.nl Nice people too! A great review Barry and typical of your high standard impartial assessments. I have just bought this uke to complement my collection of concert ukes and one tenor uke (concert is my favoured size). I agree with everything you have said apart form the subject of the tuners where I don't have sufficient experience to make a judgement. To me these geared tuners are fine. The two main attributes that stand out for me are: No 1. The sound - it is so loud (louder that my concert ukes) and with a rich tone. I feel it sounds better being finger-picked than strummed. No 2. The build standard; as you say, has no frills but gives a lovely solid, well-made, well-finished appearance. And to top it all (you may not believe this!) Omega Music in the UK (http://www.omegamusic.co.uk) are currently selling on offer the Ohana SK-25 with a hard case for £99! If you just buy the uke, it will cost you £115! I fancy the idea of adding a pickup to this soprano uke to make it my only electro-acoustic uke. Do you think that would work and what would you suggest in terms of kit? Finally, I find you uke review scoring system useful for comparison purposes but, personally, I would give 'sound' a 2:1 weighting factor over the other parameters; it's that important (perhaps giving Value for Money also a higher rating than present (yours is a 1:1:1:1 weighting system. Keep up the great work (would love to know if you have a 'day job' since the ukulele is obviously your passion!). Recently aquired an Ohana SK35S (£127.99 from those lovely folk at Eagle) and it is a fantastic, solid instrument at a superb price. Perfect set up, great tone & volume and even has side fret markers! Bought it after reading your SK25 review, so can't thank you enough.